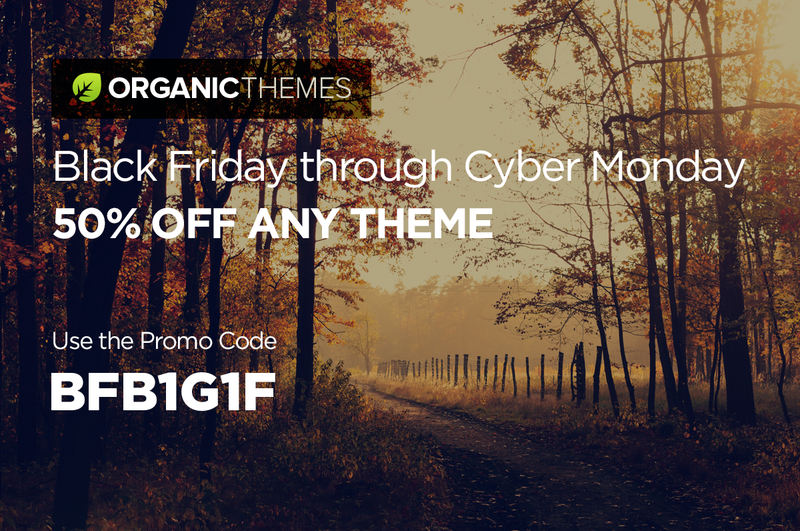 Black Friday through Cyber Monday we’re offering 50% OFF any Organic Theme! Our biggest sale in history! This sale applies to our most recent release as well, the Vital Theme! Use the Promo Code BFB1G1F at checkout with the purchase of any theme. In addition, we’re offering a FREE 14-day trial of our amazing Instant Setup service! Get premium Managed WordPress Hosting, automatic installation of WordPress and our awesome Swell Lite theme upon sign-up, instantly! After the trial, it’s only $20/month to continue with your hosting and theme. Use this link to get started! Give the gift of a new website for the holidays!